Please take a look at this photograph,which I have been searching for 3/4 days now. You will notice the nuts are still in place on top of the flange. It is Standard Operating Procedure to place a nut on the underside of the flange and two nuts on the top side. 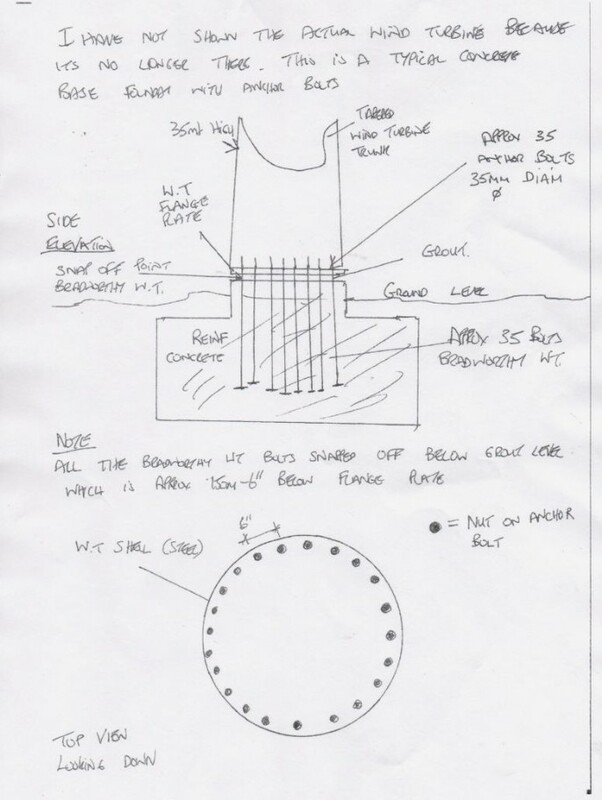 This photograph would indicate the root cause for the wind turbine collapse was caused by sabotage ,i.e cutting through the base retaining bolts just underneath the flange plate. However, it cannot be ruled out to a degree of certainty of steel bolt failure but I would lean towards sabotage at this juncture. If it is indeed sabotage there is /will be an urgent need to review security of these remote wind turbines. I can't accept the delay in publishing the results . I also have concerns for the lightning protection of these wind turbines. Hence, they might want to include that topic when they review the security matter. Tilting at windmills - contracts drawn up between investors and the electricity companies are being criticised for being heavily skewed towards investors - providing for 20 year income guarantees whatever the power produced - not bad if you can get no risk; the windfarms will almost certainly fail , or never produce more than 1% of our needs. Now a second wind turbine has collapsed. I am getting concerned at the delays in publishing the root cause of the Wind Turbine in Bradworthy at Ash Farm and another WT Collapse somewhere in Cornwall. Within 24 hrs you had issued a public statement saying that it was not caused by any malfunction or design of the wind turbine but you had not concluded your investigation with respect of the base foundations. Are you yet in a position to advise me and the general public the root causes for these two collapsed WT please. Whether or not there was a fault in the base foundations, I know not but I understand you have vicarious liability for all facets of the wind turbines. I have heard it said that sabotage would be the most likely cause. I look forward to hearing from your soonest. MP for Exeter. Do you not agree with me the root cause of these Wind Turbine should have been released sooner. I am somewhat concerned at the delay by the HSE in publishing their report into the root cause of the Wind Turbine (WT) collapse at Ash Farm, Bradworthy and the other subsequent WT collapse in Cornwall which, I appreciate, is outside your remit. It is nearly 3 weeks now since the WT at Ash Farm collapsed and I do not accept it should take the HSE so long to establish root cause of that collapse. In my view,any investigation into such incidents should be accelerated through the HSE system owing to the health and safety of the general public & environment(animals) at other similar WT locations under your remit. Indeed, I would suggest your office has a duty of care to share such information with Cornwall CC and Devon CC. From my experience, the HSE move at snail's pace and I am not afraid to say that in my view, the HSE have been known to milk the system on such straightforward benign incidents/accidents. I believe the root causes of such incidents could be established in less than 48hrs. Indeed, 48hrs is very generous; it could/should be done in less than 24hrs,if taken seriously. Whilst the HSE continue to drag their heels on these two particular WT failures, the health and safety of the general public across the South West is being compromised. In actual fact, I would even suggest that the TDC are failing their fiduciary duty of care in NOT issuing a Public Safety Warning in the local and national press & TV/Radio for the general public and for the TDC to initiate an EXCLUSION ZONE AROUND OTHER WIND TURBINES. Further unnecessary delays by HSE may well result in body bags being required should another collapse occur in a area used by the general public. I have no desire to cause any unnecessary alarm or distress to the TDC but I fervently do believe that speed is of the essence in this matter. Let's no beat about the bush here Mr Parsons, the HSE need a size 9 up the backside to complete, what is a very simple benign straightforward safety audit. I would be most grateful if you would bring this matter to the attention of the Energy Minister please and forward this email to the Devon County Council owing to the Lifetime email ban. Please see my recent email to the Chief Executive Officer, Torridge District - Barry Parsons, which is self explanatory. I write to you in your official capacity as Minister for Energy, and I call upon you to hold an immediate inquiry into the public safety related to wind turbines and in particular the physical stability/safety of the turbines in the South West. I call upon my MP to write to the Devon County Council seeking assurance that all the wind turbines in Devon are safe. When I say safe, I am not referring to the "side effects" of Wind Turbine Operations; I am referring to the physical stability and safety of the wind turbine structures. Upon reflection of the two recent wind turbine collapses - one in Devon and one in Cornwall, I think there is a need for a full safety audit, especially to those wind turbines installed by Endurance Wind Company. I have particular concerns for the concrete foundations of the WT and for the Lightning Protection System (LPS) for the WT in Devon and South West. I am also deeply concerned for the delay by the Health and Safety Executive to publish their report on these wind turbine failures. I was shocked to learn from the Torridge DC that they do not require any Environmental Assessment(EA) before approving the design and installation of wind turbines. Can you please check with the DCC if they also don't undertake any Environmental Assessment on the proposed wind turbines? My understanding of Government guidelines is that a FULL EA will be undertaken BEFORE approval. As a former Environmental Minister, I am sure you will be able to explain why the EA have been bypassed. Thank you for your prompt response to my phone call earlier this morning. Unfortunately, there is nothing in your email below which would convince me you are taking this matter seriously. This incident happened three weeks ago and you are still no wiser what the root cause for the collapse of the wind turbine. Miss Sharland, you can fool some of the people some of the time but not all the people all the time, and in my view, you should have been able to publish a FULL REPORT clearly stating the full reason for the collapse of the Bradworthy Wind Turbine. You claim to have one of the most experienced technical teams in the UK, but you are unable to determine the root cause of the wind turbine collapse some 3 weeks down the line . They can't be THAT GOOD then, can they? Let's not beat about the bush here, you know or you should know what has caused that wind turbine to collapse but you are surrounding the collapse in a veil of secrecy and deceit, and I would hazard a guess that your sub-contractors have attempted to cut corners with some Chinese cheap counterfeit anchor bolts which have snapped of like twigs. Hence, you put out your public notice that there is a "COMPLICATION". I don't see this as a complication, I see it perhaps as a wider conspiracy to commit fraud and misinform the general public. The first thing you should have done is to demolish the concrete foundations and recovered all the anchor bolts for analysis and scientific testing. but your company chose not to take this route. It does not fill me with any confidence whatsoever to know the Health and Safety Eexecutive are also involved in this wind turbine collapse, as they are well known to milk their investigations. At this juncture, the health and safety of the general public is being compromised owing to you company's failure to identify the root cause of collapse. Dulas has a duty of care to announce a provisional root cause and ensure all other Dulas WT are segregated from the General Public. I fully appreciate you might be offended by my frankness and bluntness but if it saves lives, then sobeit. You informed me this morning it could take many months to identify the root cause of the WT collapse and my response to that is hogwash. You and your line management KNOW or you SHOULD KNOW what the root cause is. Hence, I call upon Dulas to cease this deception and disinformation and inform the general public NOW. BTW, I also hold serious reservations for your WT Lightning Protection Systems. Would be so kind as to send me a typical LPS schematic drawing of you LPS for your Wind Turbines? Please find below our company statement regarding the turbine incident in Bradworthy, Devon. I would have thought this would be a minimum requirement, wouldn't you? No wonder their wind turbines are falling over like dominoes. As the Energy Minister, I am sure you will be aware of the importance of ISO 9000 and 14000 standards. I call upon the Minister of Energy to ensure any Government Contracts awarded for wind turbines should ensure ISO9000 and ISO 14000 as a bare minimum. I am also VERY concerned that these wind turbines are being designed, constructed and operated WITHOUT planning permission. In particular, the Bradworthy WT was given retrospective planning approval, which I do not accept is right and proper. I am currently seeking employment. Hence, if you need a good troubleshooter to oversee the WT Installations nationwide, I am interested. I have just had a telephone conversation with Leila Sharland the Dulas Project Manager for the Bradworthy Wind Turbine which collapsed last month. She advised me that she DID NOT know the root cause of the collapse and in her opinion these investigations could take months. I find this most disconcerting because there is no valid reason why the root cause of this collapse should take months to establish. I could tell you what the root cause is within 24hrs. In the meantime, public safety is being compromised at other Dulas Sites. I call upon the Minister of Energy to get to grips with this matter. It is an absurd statement from the Dulas Project Manager that the root cause for the WT collapse will not be known for months; she would say that wouldn't she! The dangers of wind turbines. I can confirm that HSE holds limited information about this incident. conduct investigations generally and this investigation in particular. Speed is always important in any such safety investigation into such incidents and the the HSE admit that nearly a month after the collapse the investigation is at "early" stages and they have" limited information". which I can tell you categorically IS THE ROOT CAUSE of the collapse. In essence, the failure of the HSE to take custody of these anchor bolts will give an opportunity of any would-be criminal to dispose of the said anchors bolts,i.e tamper with evidence. There is no doubt in my mind the anchor bolts are counterfeit material and the grout under the tower was a weak as my mother-in-laws gravy. I am writing to request an internal review of Health and Safety Executive's handling of my FOI request 'Wind Turbine Collapse'. I do not accept your decision based on the Public Interest Test. I argue that the Public Interest Test for early information FAR outweighs any possible criminal connection. I would also argue the HSE are failing their fiduciary duties in withholding such information, as it prevents SIMILAR incident/accidents happening. The following is an update regarding the Tower Collapse in North Devon on 27-January-2013. Immediately upon report of the tower collapse, our technical teams from the UK and Canada were deployed and arrived on site within hours to start an investigation. While there was no malfunction or abnormality with the turbine or tower (contrary to early inaccurate media reports of a fire and and/or missing by Shopping Sidekick Plugin" href="http://www.endurancewindpower.co.uk/#"fasteners), there was a problem with the structural grout and the manner in which the tower was fixed to the foundation that affected the durability of the anchor rods resulting in the tower collapse. The customer in this case has been assured that his turbine will be replaced and the foundation will be corrected. The investigation team was quickly able to identify and isolate 29 turbines that might have been affected by this problem, and at the same time confirm that all other turbines in the fleet were safe and unaffected. If your turbine was part of that small population of early installations affected, you would have already been notified and advised that remediation work, if required, would be performed on your foundation at no cost to you. In many cases, all of the necessary work has already been completed and the turbines have been returned to service. Our current priority is to correct the installations for remaining customers as quickly as possible so that customers can resume producing electricity without risking public safety or jeopardizing the long term durability of the foundation. In all instances, remediation work is being directed from structural engineers "
There is nothing in your letter below which would remove my concerns for the safety of the general public in the South West. The Dept of Energy are failing their duty of care to ensure public safety. No wonder Ed Davey won't respond in person. He's a member of the Ostrich Family like Bradshaw??!! Lets wait until we need the Body Bags then shall we,.It will suffice my purposes to have informed the Minister of this matter.